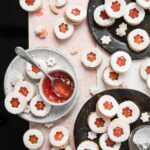 Recipe for Grapefruit Almond Linzer Cookies, the classic "windowpane" cookie sandwich made with almond meal and filled with pink grapefruit marmalade. Pretty, fruity, and bite size cookies perfect for a tea party or fun treat. Whisk together flour, almond meal, cinnamon, and salt in a small bowl and set aside. Remove dough from bowl and form into a ball with your hands. Remove one dough half from fridge and roll out onto a floured surface to 1/8 in. thickness. Now remove your second half of dough and repeat with cookie cutter with center shape. (You can keep the center shapes and make small cookies or add them back to the scraps, roll out and make larger cookies). Spoon a teaspoon of marmalade onto the middle of your bottom cookies. Place the top cookie onto the marmalade. Make a pot of tea and eat your beautiful cookies!